A gorgeous design made with fresh flowers and macaroons- perfect as a wedding cake. 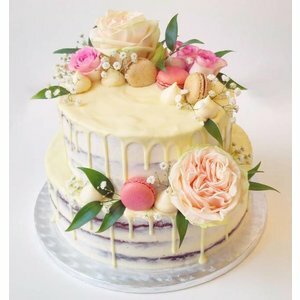 A classy and elegant naked drip cake design with fresh flowers, our home made meringue kisses, crisp white chocolate drip and macaroons on top. * If pink roses in the right color aren't available/ in season we will match another flower in the right size and the right shades of the color scheme to create the right look.